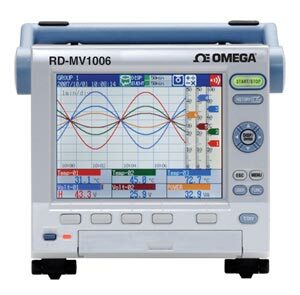 The RD-MV1000_2000 Series has been discontinued. Please see the RD9900 Series as a possible alternative or contact our Data Acquisition Engineering Department. The RD-MV1000/MV2000 portable paperless recorders are high performance and easy-to-use test instruments that handle a wide range of measurements in your lab, plant, or test stand. These recorders have powerful stand-alone data logging capability. The units record on-site changes in temperature, voltage, current, flow and pressure. The RD-MV1000 features 24 channel-input and RD-MV2000 has 48 channels. Both models feature 200 MB of memory, allowing data to be stored for approximately 70 days at one-second intervals with a 12-channel model. The recorders feature guidance messages for set-up and entering of settings. Measured data can be stored in text format on removable storage media for further processing and data back up on a personal computer using standard software. The RD-MV1000 features a 140 mm (5.5") color TFT-LCD display and the RD-MV2000 has a 264 mm (10.4") display. The RD-MV1000/MV2000 series is a portable recorder that displays real-time measured data on a color LCD and saves data on a Compact Flash memory card (CF card). It can be hooked up to network via Ethernet, which enables to inform by E-mail and to monitor on Web site as well as to transfer files by using FTP. Also, it can communicate with Modbus RTU or Modbus TCP. The data saved on a CF card can be converted by data conversion software to MS-Excel or text format file, facilitating processing on a PC. Not only this, the Viewer software allows a PC to display waveforms on its screen and to print out waveforms. Note: The LCD may contain some pixels that are always lighted or that never light, and variations in brightness may occur due to the characteristics of liquid crystals. Please note that these are not defects. * Installation category (over voltage category) II: describes a number which defines a transient over voltage condition. It implies the regulation for impulse withstand voltage. "II" applies to electrical equipment which is supplied from fixed installations like distribution boards. ** Pollution degree: describes the degree to which a solid, liquid, or gas which deteriorates dielectric strength or surface resistivity is adhering. “2” applies to normal indoor atmosphere. Normally, only non-conductive pollution occurs. *** Measurement category II: applies to measuring circuits connected to low voltage installation, and electrical instruments supplied with power from fixed equipment such as electric switchboards. Other ambient conditions such as vibration should not adversely affect recorder operation. Warm-Up Time: At least 30 min Other ambient conditions such as vibration should not adversely affect recorder operation. Output points: Choose from 2, 4, 6, or 12* * Only with the RD-MV2000. Viewer Function: Waveform display, digital display, circular display, list display, report display etc. 참고: Comes with operator's manual on CD, power cable, quick reference guide, terminal screws and the DAQSTANDARD software (CD), CF card (128 MB). Software is compatible with Windows 2000/XP/Vista.